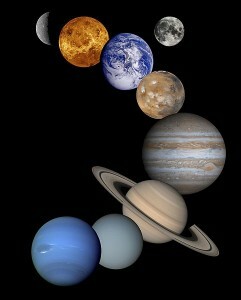 Let’s look at May 2010 to see what the planetary influences are and how we can work with them. We’ll start with the most long-range and overarching influences, the planets Pluto, Neptune, and Uranus, which you will notice do not change from month to month but stay in the same sector of the sky for many years. Then we will look at the mid-range influences, Jupiter and Saturn, which stay in the same sign for 1 – 2.5 years. And last we’ll look at the sign and dates for the New and Full Moons, as these mark the waxing and waning cycles in our daily lives. There are six notable changes in the skies in May: Mercury and Saturn resume direct motion, Neptune turns retrograde, Venus enters Cancer, the Sun enters Gemini, and Uranus enters the sign of Aries. We’ll discuss each below. We’ve spoken at length about Pluto in Capricorn (see category at right), where it will remain until 2024. In a nutshell, this long transit will bring fundamental change to many of the structures we have come to rely upon: government, religion, the economy, industry, and transport systems, to name a few. The transit carries the energy of revolution and evolution and can be dramatic and at times overwhelming. Pluto exposes what is hidden, sometimes for the better and sometimes for the worse. Pluto hastens and intensifies the processes of endings and new beginnings, and in Capricorn will bring about the ending of our business pursuits that are no longer suited to our growth and personal evolution. Whatever has been slowly leaking vitality will go ahead and die, including old business models, practices, and products. This is formidable energy, and your best strategy is to tune in and work with it. Find an area in your business life in need of renewal and begin the process before Pluto reaches planets in your chart and forces the issue. Everyone with planets in the first seven degrees of Aries, Cancer, Libra, and Capricorn is already dealing with this energy. Pluto turned retrograde on April 6. This retrograde motion combined with the extremely long orbit of the planet causes it to traverse only 3 degrees of Capricorn during the entire year. Last December it was at 2 degrees, by April 6 it has reached 5 degrees, it retrogrades back to 2 degrees by mid-September, and it doesn’t reach 5 degrees again until next January. If you have planets between 2 and 5 degrees of any sign you will experience a deeper and deeper probing and cleansing all year long, probably related to the issues mentioned above. Pluto transits can be difficult, but when the work is through, they are the most rewarding because we are irrevocably freed from a long-standing, but hidden, issue. You may have noticed a reversal since April, leading you back to a problem you thought you had resolved. Not yet! There’s still more freedom to be gained. With Neptune in Aquarius (see category at right) from 1998 to 2011, there has been a global consensus regarding the equality of the common man, shared responsibility to the group, ascendancy of people and nations based on the power of knowledge, the right of all nations to progress technologically, and the right of each person to contribute to and further the base of common knowledge. The best way to work with this energy is to allow your rational mind to open to waves of inspiration from the collective whole, from your community to the global community. Expect to be inspired by your neighbors and friends. Neptune will turn retrograde on May 31. Neptune, like Pluto, has an extremely long orbit which combined with its annual retrograde motion causes it to traverse only 3 degrees of Aquarius this year. In February it had reached 25 degrees of Aquarius, by May 31 it has reached 28 degrees, on November 8 it turns around after travelling all the way back to 25 degrees and it doesn’t reach 28 degrees again until next February. If you have planets between 25 and 28 degrees of any sign you will experience a subtle but powerful dissatisfaction with certain areas of your life and a yearning for a more meaningful connection to others. This disconcerting influence can dissolve the forms in our life that have no real content for us anymore. This can be disorienting and confusing while it is happening but once these deeper connections are made, the benefits are rewarding and long-lasting. The Uranus in Pisces (see category at right) transit from 2003 – May, 2010 engendered innovation and invention in business. It flattened hierarchies and enhanced global transactions and interactions. With many variables in play simultaneously, we’ve been working with moving parts which connected and disconnected frequently, including projects, alliances, and workforces. How can we continue to work with Uranus in Pisces? Product diversification, committee leadership, and collaboration, as well as global connection, and dissolution of hierarchical structures – any of these is good for the end of the cycle. On May 27, Uranus enters the sign Aries. This is the very beginning point of an 84-year cycle. Aries is a very different energy from Pisces. Where Pisces is concerned with the collective and with dissolving the boundaries between us, Aries is the spark of entrepreneurial spirit, the initiating impetus toward independence and individuality. For the next seven years we can expect the Aries energy to influence innovation, creativity, and breakthroughs in a spirit of renewal. Get ready for a whole new cycle of invention and scientific discovery. If you thought the last seven years were exciting, wait until you see the next! Saturn had been transiting the sign of Libra, where it is exalted, but last month, due to retrograde motion, it regressed back into Virgo. On May 30 it will resume direct motion. Did you notice a shift last month from cooperative alliances to a focus on organizing and managing your own personal sphere of work? This is an excellent time to detail a plan for the next few months and set up back office systems to accomplish it. Until October 2010, Saturn is in square aspect to Pluto in Capricorn (see above) but during the time it’s in Virgo the tension between the two planets is not as hard to reconcile. We can use the energy of Saturn in Virgo to address the stresses coming from Pluto in Capricorn. There’s nothing like a detailed plan to follow when things get tough. Jupiter entered Pisces, a water sign, in January. Pisces is concerned with the emotional connections that bind people together. This can express itself as devotion to an ideal, often mystical or artistic, and the desire to lose oneself in the shared feeling of the group. Jupiter, the planet of opportunity and expansion, is the ancient ruler of Pisces. This brings a very positive influence to all endeavors that attempt to unite people based on a shared intention for the future. How should you work with this energy? Work on connection. Set up links between people and organizations. Make venues available for your employees to express their ideas creatively. Be willing to lead with your intuition and feelings; show your employees, customers, and business associates your heart. These activities will bring business expansion and profits. When Mars is in Leo our will power becomes focused and controlled. Mars in Leo loves to lead and gives faithfully and generously to those who follow. When Mars is in Leo we are honest, direct, and fully dependable. The sign Leo is also creative and artistic, so at this time we love performance and display. The best use of Mars in Leo? Make your light shine with dignity and strength. Lead with steadiness and authority. Throw yourself into creative activities. Secure and enjoy the limelight. Mars resumed direct motion in March. Due to its retrograde cycle, Mars had retraced its steps all the way back to the very beginning of Leo. Mars has been picking up steam and moving forward and on May 16 we finally reach new ground. While retaining the best of the old, this is when we can really begin actively pursuing brand new projects that have been waiting their turn for a long time!. Mars leaves it long journey in Leo in June. Take advantage of these last weeks of heightened creativity and expect high performance from your employees too. When Venus is in Gemini, we are extroverted, chatty, and love nothing more than to scatter our attention across many projects and many people. We are happiest when we’re out and about, making new contacts and negotiating deals. When Venus moves into Cancer on May 19, we step into another mode. You may notice you have more empathy for your employees’ issues and a deeper understanding of your customers’ needs. Your finances ebb and flow while Venus is in Cancer, like the waxing and waning of the Moon. Your fortune lies in your ability to treat people like your own family at this time. Mercury remains in retrograde motion in Taurus until May 11. Until that day, continue to review the past and look for what you may have overlooked that would be useful for you in the future. After May 11 your projects and plans can move forward, including new contracts, agreements, and equipment purchases. Don’t be surprised, though, if you continue to rehash agreements and commitments from the past; Mercury doesn’t cross into new territory until May 28 when it reaches the point it went retrograde. After that day, new information will actually start to flow and new ideas will be ready for action. The Sun remains in steady, reliable Taurus until May 20. The Taurus energy urges us to build something slowly and steadily out of the ideas that were born when the Sun was in Aries. Putting scaffolding around the emerging form, we begin to manifest our idea into material reality. When the Sun enters Gemini, the time is right for sales and communication, press releases, and disseminating the news as widely as possible. We may become aware that we need other players on our team in order to broadcast our product as widely as possible. Communicate, communicate, communicate. Just be sure you only promise what you can deliver. The new Moon is in Taurus on May 13, waxing to full in Sagittarius on May 27. Against the backdrop of massive global changes to the structures in our lives, we are inspired by and engaged with the global community as never before. As Uranus moves into Aries, we may not recognize the business landscape anymore but with Saturn back in Virgo, we can put our energy into getting our houses in order and implementing a system to stay that way. Jupiter in Pisces and Venus moving into Cancer enhance our emotional bonds to one another, which we can count on if we get too shaken up or results oriented. Communication and sales efforts are key for the later part of the month with the Sun moving into Gemini and Mercury in direct motion in Taurus. This entry was posted on Friday, April 30th, 2010 and is filed under Astro4Business Month Ahead. You can follow any responses to this entry through RSS 2.0. You can leave a response, or trackback from your own site. Thanks, Ellen, for such a clear and detailed look at the months ahead. Very illuminating. Thanks so much Laura. Glad you are enjoying it.